Like this video? Click here to follow me on YouTube! 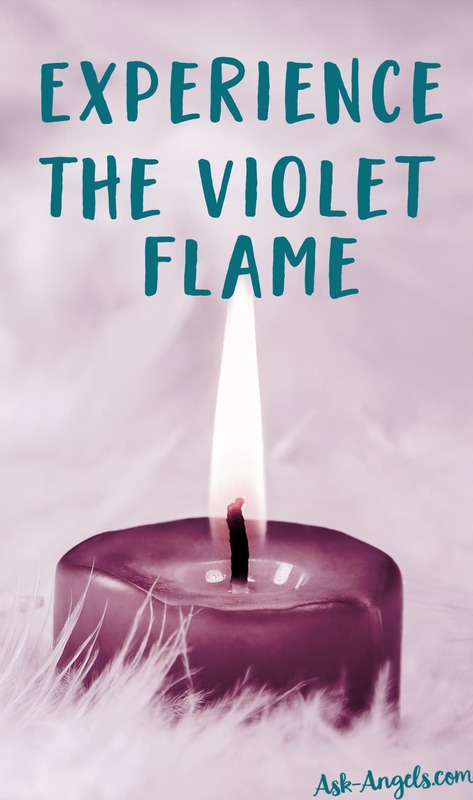 If you're not familiar with the violet flame, it’s a form of spiritual fire. It’s the violet flame of transmutation that clears negativity, density, and limiting thought patterns. It will even clear limiting beliefs from your mental, emotional, and spiritual being. Archangel Metatron, Archangel Zadkiel, St. Germain, and Jesus are closely connected with the violet flame. They are on hand to help us experience the violet flame right here and now. I invite you to join me in closing your eyes, taking a relaxing breath and shifting your awareness inside. I ask that we each be surrounded with divine light, with our teams of Guides and Angels. Archangel Metatron, Zadkiel, St. Germain, and Jesus step forward to assist us in tuning into, experiencing, and receiving the benefit of the violet flame right here and now. We are here and we merge our energy together to speak this message now. Know that you are, indeed, in the presence of Angels, Guides of light. You are, indeed, in the presence of love, light, and the energy of transmutation. Let yourself relax, for it is from this relaxed, inward-focused place that you are able to tune into higher vibrational light. That you are able to tune in and become aware of the violet flame appearing before you now. See, visualize, sense, and imagine the violet flame of transmutation appearing in front of you and beginning to move in all around you. You may visualize or imagine this flame as being very bright, very large, or very tall. It contains the pure energy of source, divine light. It brightly burns around you now to cleanse and elevate your vibration. To release, dissolve and remove from your energy lower vibrations of tension, density or negative emotion; to release and dissolve any lower vibrational entities, thought patterns, attachments, or implants which do not serve in your ultimate awakening. Breathe and let your awareness focus upon the area of your heart, visualizing light glowing therein. Let the light then travel upward into your throat, opening and expanding and traveling upward more into your third eye, your mind’s eye, opening and expanding and traveling up into your crown, opening and expanding. Now, let your awareness expand to tune into your oneness with the violet flame of transmutation; with your oneness with the violet flame which is a conscious energy which you can call upon. I now call upon the violet flame to surround me, to cleanse my energy, and elevate my vibration. Know that when you speak these words silently or aloud, it is so. Let your level of awareness remain focused within as the violet flame brightly shines all around you. Let it connect you with the higher realms of existence, with the higher levels of divine love by helping you to consciously expanded and release lower levels of emotion. Take a deep breath in as you begin to tune into any lower vibrational energy you are carrying. And as you exhale, let go and release all density, negativity, lower vibrational emotion, and fear based constructs. Breathe out and release all that no longer serves your highest interests into the light of the violet flame where it is released into the divine light, and so it is. Relax and let the spiritual vibration of the violet flame replenish your energy body, returning pure divine light and source light into your mind, body and spirit. Imagine that you are lifting up in the violet flame, that it is elevating your light, cleansing you on every level. You effortlessly shine brighter, more radiantly, more authentically, more in alignment with your truth as an awakened spiritual being in physical form. Shine your light, visualize the violet flame glowing brilliantly around you, transmuting lower levels, protecting you, elevating your vibration and reconnecting you with divine light. With the violet flame all around you, expand your focus to tune into the collective consciousness of humanity. Surround humanity with the violet flame, transmuting fear and negativity, transmuting ego, judgment, pain. Release the lower levels of density, stagnant energy, fear-based constructs and the energy of manipulation into the light, into the divine. Let these lower vibrational energies go. Now, expand your awareness to tune into the earth, the light of Gaia. Surround Gaia with the violet flame of transmutation, assisting her to cleanse and release that which no longer serves. Release tension, negativity, fear, and toxins into the light of the divine. Release into the light of the violet flame. Visualize the violet flame of transmutation shining brightly around Gaia, around humanity, your city, home and self. Allow this visualization to help you be fully present in this moment here and now, free from the ego’s desire to focus on the future or dwell on the past. Rather, return your full awareness to the present where all of your power resides. Tune into this through your open-heart. Dive into the heart and let your light expand and shine, knowing that we, Metatron, Zadkiel, St. Germain, Yeshua are here to support and serve in any moment. Invite us in and call upon the violet flame directly to transmute and release lower densities, so that your authentic brilliance and radiant light may once again vibrantly shine you as an individual, you as humanity, you as Gaia, you as the limited version of self you recognize and you as the expanded version of self that encompasses all, that is one with all that is, that you authentically are. We love you, we honor you, we bless you, and so it is. Invite us in and call upon the violet flame directly to transmute and release lower densities, so that your authentic brilliance and radiant light may once again vibrantly shine you as an individual, you as humanity, you as Gaia, you as the limited version of self you recognize and you as the expanded version of self that encompasses all, that is one with all that is, that you authentically are. We love you, we honor you, we bless you, and so it is. 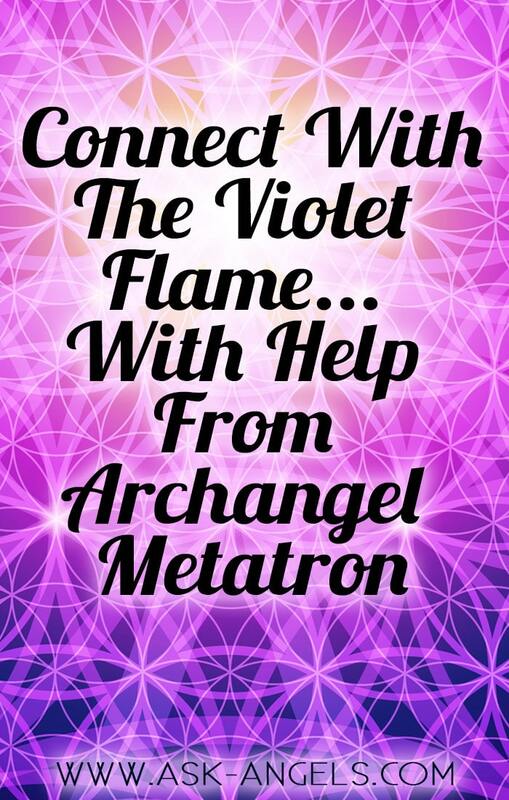 In addition to the channeling above, I've channeled this message from Archangel Metatron on the Violet Flame as well. Check out the Crystalline Violet Flame Meditation here! Beloved beings of light. I am Archangel Metatron, and I am honored to be connecting with you now. Take a moment now to quiet your mind. Take a deep relaxing breath, and drop your consciousness into your heart, allowing your heart to open, and allowing your awareness to focus within. And now, I offer you an energetic tool. A powerful tool of transmutation. As you now breathe, and read and focus inward, you may begin to notice that you are now surrounded with this sacred spiritual fire. The violet flame surrounds you now. Allow yourself to relax, to tune into this Divine light that surrounds you and pours in through you. Feel your energy raise. Feel your worries dissolve. Know that the powers of the violet flame are not limited, and they can be used in any and all areas. All negativity is now transformed into light. All limiting beliefs transmuted. Your energy is lifted, from within your own heart. Notice as you direct your focus deeper and deeper inward (look inside of your open heart) your energy expands higher and higher. You are able to right now to access multiple dimensions from within your open heart. You are a third-dimensional being, and mastering this realm is important, and in fact, the first step in your ascension. But know that your transformation and growth does not end here. There is more to mastery than the third-dimensional reality. And you beloved, are such a master. You are ready, willing, and capable of moving beyond the third-dimensional classroom of life, and into your post-graduate study of the crystalline dimension. The dimensions of heaven on earth, pure love, pure light. The violet flame is a tool to assist you in your mastery, in your ascension, and you can begin by calling it into your awareness often. While you are at work sitting at your desk. Call upon the violet flame to surround you, and fill your building. When you are driving, call upon the violet flame. There is no formal invocation that is necessary, in order to invoke the powers of spiritual fire, the purple fire of transformation, and transmutation. Know that simply thinking or speaking “Violet Flame”, calls it unto you, and it begins to work immediately. You may choose to invoke the violet flame in a more formalized manner, and this is fine. However is fun and however, you feel works for you. You may also carry an amethyst crystal to intensify the power of the violet flame, but know that this is not necessary, the violet flame surrounds you now, and know, that it is now within your control to invoke and use the powerful spiritual fire of the violet flame often to assist you in mastering this dimension, your third dimensional reality. When I say mastery of the third dimension I am speaking in terms of prosperity, as well as happiness and love. But the violet flame also assists you in opening to your unlimited multidimensional nature and unlimited abundance. Yes, you are physical. But within your heart, by looking within and calling upon the powers of the violet flame from the powers of the ascended masters, and archangels, gods and goddesses… You are able to remember and recognize that you are unlimited. Return here to this space and knowing often. Check out the Crystalline Violet Flame Meditation with St Germain and Lady Portia here! Hi Melanie – This was wonderful. I always feel as high as a kite when you are finished. Thank you so much. Ma’m, this was so peaceful. It gives a certain sort of satisfying thoughts. Its an honour to find you in such a big big world. Beautiful, loving, adorable message ma’m. Thank you. I enjoyed the meditation. Thank you. I am aware of a pink light that feels soothing and comforting and I don’t have words to express what else I am aware of. What is your awareness of pink light? Pink light resonates with an incredibly high vibration of peace, compassion and love. Easy, simple & very effective. The violet flame completely surrounded me & released anything – including any discomfort like any residue of my migraine this morning so I feel completely whole again. Thank you for this meditation & will use again if required! Love & Light Melanie!!! Thank you so much, this filled my aching heart! Very Powerful! Thank you so very much for that. I absolutely enjoyed it. I feel so relaxed right now. Thank so much for doing this meditation it gave me the chills. Which is good because I felt a shift. My friend Andrea recorded a violet spectrum beam of light manifest on her families property between Mt. Ida Arkansas and Hot Springs, Arkansas. The third time it appeared, it came down on top of her. It was a simple little camera. I have never witnessed anything like it. If you would please email me, I will send you a link. She was previously being spiritually attacked and still needs help clearing herself. She feels a soul purpose of being a healer and has physical awareness of illnesses of others in proximity to her. Please help. Thank you. My experience with the violet flame was/is exquisite. It brought healing, unblocked chakras, release negative beliefs systems that no longer served me. Although it’s difficult to put into words, it allowed me to connect with an existence off true freedom and criative power. Once in my life I was allowed to break free of the illusion of separation. I was/am in the state of oneness with the Divine as with all the rest of creation. This is the new earth reality. This is what we are aiming for. May you all be bessed with the experience with the violet flame. Mother Gaia count on us to do this shift of consciousness. To bring this state of consciousness into manifested reality. It is in our hands. We don’t have much time left. I’m counting with your help. You’re welcome! glad to hear this was helpful for you! I love all your meditations and your beautiful energy inspires me so. Thank you, thank you , thank you . Thank you ! So needed , so thankful for your gift ! Thank you so much for chanelling and always continung to give us new ways to ascend and shine our love and light. My first intro to The Violet Flame and I Am Presence was your chanelling with St. Germaine & Lady Portia and along with your cards learning of Archang Zadkiel. Oh Melanie, I enjoyed this. meditation very much! 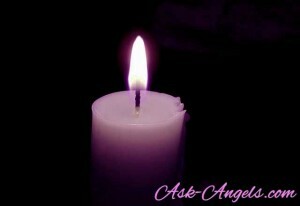 As always, your meditations from the angels are very powerful and healing. Thank you for using your abilities to reach so many who need this. Thank you so much. That was lovely! I love your videos all the time and tell all my friends. the flame the during the flame the top of my head had a sensation very strong. Have you ever channelled archangel michael or other named angels? thanks! I needed this also! Yes. I was taught to sheild up and call in Arch Angel Michael and his band of mercy to surround me and stand with their bright blue light. Arch Angel Michael can be asked to cut all unneeded energetic cords to the left, right, above, below, in front, and behind using his mighty sword of flaming light.